When used properly, John Malkovich is the best of the best when it comes to playing the bad guy. 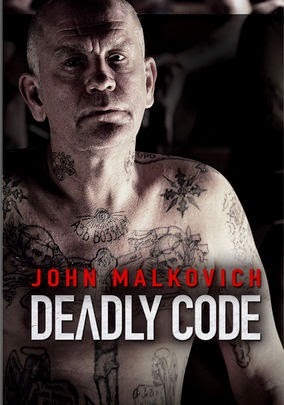 In his latest film, Deadly Code, Malkovich is playing the Grandfather of a Siberian crime syndicate and much like Brando in the Godfather, is used sparely to impart words of wisdom on his young decedents. Siberia is one of the coldest and most desolate places on the planet. When a criminal is too dangerous to even be put in the jail of a major Russian city, they are dumped into Siberia. Crime is rampant and everything is run by organized crime families, who's strict code of loyalty and honor puts even the Italians to shame. Kolyma (Vilius Turnalavicius) is the grandson and the film is split between Kolyma in the army, hunting down a wanted man, and his time growing up in a crime family under his Grandfathers guidance. Mafia movies traditionally follow a format and this film was no different, with the except of the setting, so when I heard it was the Godfather of Russian organized crime and started John Malkovich, I wondered how it was possible that I'd never heard of it, well now I know. There are these crazy rules and code of honor that these guys live by, making them gangsters who aren't really violent. They simply steal from the government to help their community. In a real sense, it's about sophisticated, responsible criminals, helping people, and avoiding the police. While honorable, it makes for an extremely slow moving film, add to that all the Russian actors trying to speak English, and you have a film that's somewhat hard to even understand. Subtitles and some more action would have helped, but so would a more experienced cast. Most of these guys have no other listings on IMDB and the inexperience shows. The story of Deadly Code seems like a good idea, but when you have a lack of action, mixed with inexperienced actors, speaking in a way that is barely understandable, you have a very uninteresting movie that is more than somewhat hard to watch.